This is our newest structure kit in HO scale. NOW available in N SCALE!!!!!!!! This kit is based on the structure in Lyndonville, Vermont that is currently where the Bag Balm salve product is being manufactured. In the 20’s to 50’s this was a General store on the ground level & had rooms upstrairs, probably for the railraod crews. Did you see the product review of this by George Riley in the August issue of The Model Railroad Craftsman Magazine? Thank you George. Long Barn is based on a barn that burned down in the late 60’s. It was located at the Valley Farm in Lyndon Center, Vt. Our kit of the New England Farm House is still located at this farm. We will be doing kits of the other 2 barns that are still there. This kit is based on a farm house with a wood shed and garage here in Lyndonville, Vt. 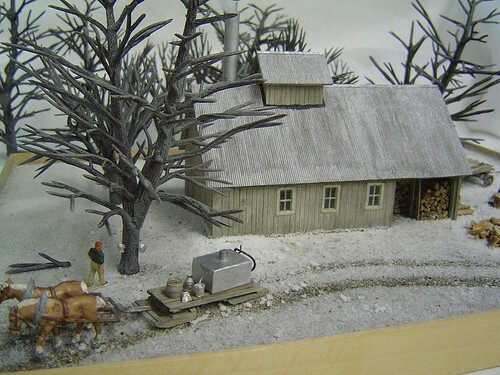 This laser cut model is based on the Smith family sugar house here in the “North East Kingdom” of Vermont. “The kit is the building only”. You will have to supply the firewood and other details yourself. FRANK J. SCHULTZ & Son Manufacturing Co.
Frank J. Schultz & Son Precision Mfg. Co. The photo above is HO scale version. HO scale kit# CLD-HO-001 $30.95. Kit has 4 sets of shop doors, and 1 entrance door. Laser cut 1/64 plywood windows. Laser cut plastic chimney. N scale kit# CLD-N-001 $ 22.00. 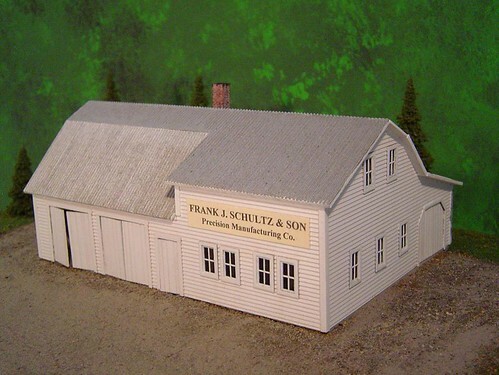 This model kit is based on actual building & co. here in the “North East Kingdom” of Vermont. The instructions give a brief description about the company. They make deep sea fishing “plugs” or lures. Our Flickr Photos - Come see our Flickr Photos!